National Hurricane / NOAA info! ​www.CaboPangas.com - << The complete panga boat website link to left. **Current storm heading towards Los Cabos? << Click here for details. Cabo Fish Dogs, a.k.a. Got Caught Fishing Charters at your service again! Fishing since 1992 and charter boats starting in 2003, charter services, experience and serving anglers, tourist and professionals alike with some of the finest fishing Cabo has to offer for over 25 years! We had some of the nicest, busiest & most successful boats in the Los Cabos marina and want to continue bringing successful, fun, fishing adventures to our clients, friends and the public alike. The 31' Bertram formally called Got Caught, is now Fin Addict and the 32' Luhrs 320 Express, Caught Again, is now Plan B. Both boats have been updated nicely and the new crews have had very successful trips with our customers. Fish Dogs, the 32' Albemarle 325 has made its way across the Sea of Cortes to a group using it privately. In the mean time we now have access to a number of additional boats which are listed on our updated site as well as a new panga boat fishing site www.CaboPangas.com. We continue to bring you great fishing expeditions & memories with a larger variety of boats and fishing to choose. As normal, we look forward to hearing from you, whether you are fishing or not, let us know how we can help you on your vacation here, get together and have a drink catching up on the past! If you're new or looking for information about Los Cabos, 25 years experience should qualify us to help you. This is a "Did you know" section on fishing DO's & DO NOT's. PLEASE DON'T KILL SAILFISH or MARLIN!!!!!! **If you want to do a "mount" of a marlin, sailfish, any fish, know that they are ALL REPLICAS! **They do NOT use any part of the fish in the mount, END OF STORY! Please do NOT kill bill fish, even for a mount! ​​PLEASE -- Release ALL Billfish, unless it will NOT survive; or you will eat it!! PLEASE DO NOT kill any marlin/sailfish, unless you know you like the meat and fully intend on eating it! It truly is not very good eating! Sailfish are even worst to eat! Dorado, yellow fin tuna, wahoo, swordfish, yellowtail, snapper, grouper, are examples of great eating fish & sierra is a favorite for ceviche! Several other fish are good, too, not listed here. ​Please take a few quick pics of the fish on the boat! Measure length from tip of bill to tail & then girth at widest point, so you have the necessary measurements for a mount or your history! Having the girth can more accurately help determine its weight. Every mount is determined simply by the length measurement. I feel girth is important but I doubt they will ask for this measurement, or at least use it, relative to your mount. 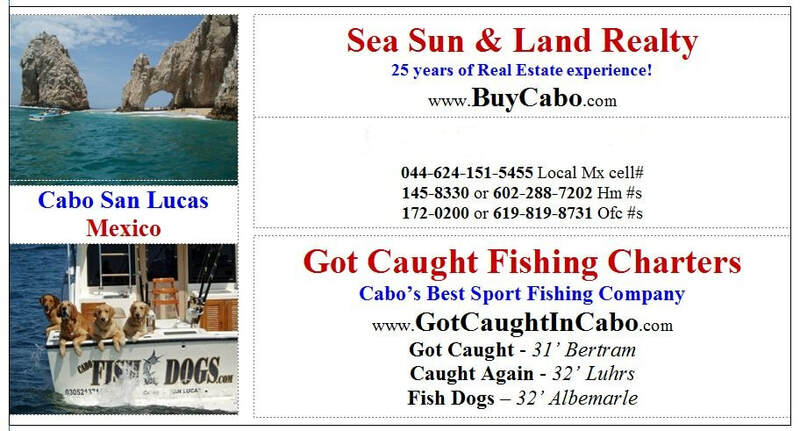 **MORE DETAILS ABOUT FISH MOUNTS IN CABO, CLICK HERE.